If you have been watching our YouTube channel, then you know our reporter Claudia Gestro has been filing video reports from Toronto, Ontario, Canada. It was the site of the 65th annual NBA All-Star game and this year the league honored Kobe Bryant, who is retiring when this season is over. The Lakers guard received 1.9 million votes, the most for any All-Star player. As a result Bryant got to start the game. The Western Conference, coached by Gregg Popovich of the San Antonio Spurs, won the game, 196-173. Obviously not a defensive game. 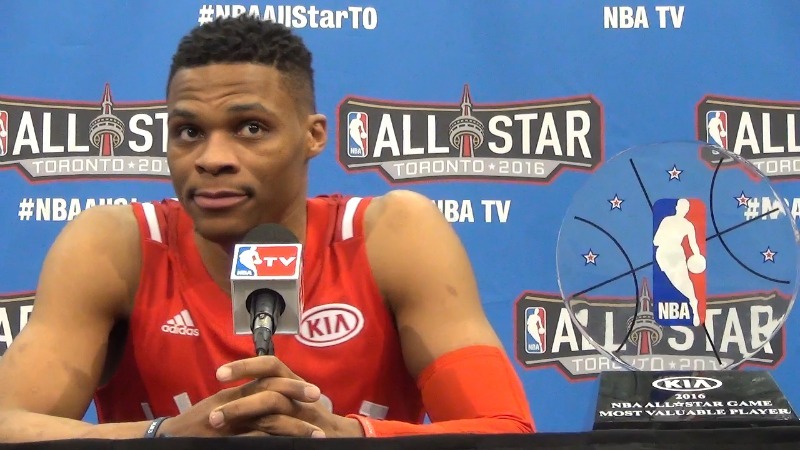 Russell Westbrook of the Oklahoma City Thunder was named the game MVP for the second year in a row. He finished the game with 31 points, eight rebounds and five assists. Paul George from the Indiana Pacers had the high score of the game, 41 points. He is just one point behind Wilt Chamberlain’s All-Star scoring record. The night was all about honoring Kobe Bryant. He was given a big introduction that included highlights from his 20-year career playing on the scoreboard above the court, plus an introduction from former Lakers great, Earvin “Magic” Johnson, Jr. In the 4th quarter when he was taken out of the game for the last time, he left to a standing ovation from the entire crowd in the Air Canada Centre. He went to every player and coach on the floor to shake their hands and thank them for being there with him. Russell Westbrook of the Oklahoma City Thunder with his MVP trophy after the game. As he walked to the end of the Western Conference bench the crowd chanted his name. It was the biggest moment of the night. Claudia did her final video from the NHL Hockey Hall of Fame, one of the places sports fans should visit if they are in Toronto. On our YouTube channel you will find video reports from the Kings and Ducks, as well as the Stanley Cup Playoffs from the past two seasons. Along with her NBA All-Star videos you can watch her Super Bowl 50 reports. Below are some of her reports from Toronto.